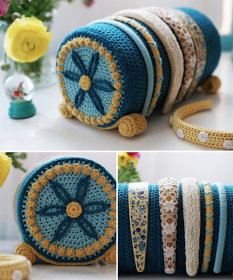 Stitch Story: A Beautiful Hairband Stand! I love being on Instagram. It puts me in touch with so many wonderful crocheters! 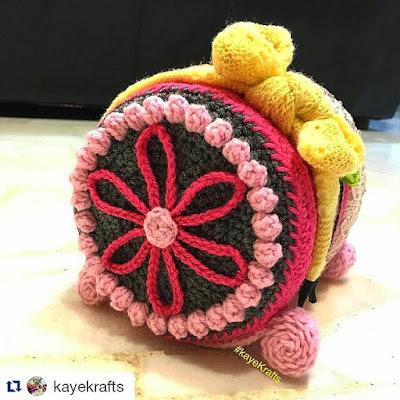 Yesterday a crocheter in Singapore who goes by the name @kayekrafts on Instagram, found a post I had done when I first saw our book, "Crocheting Clothes Kids Love" at Barnes and Noble. She commented that she and her daughter are enjoying the book, and that she had just completed her first project from the book. She made my Festival Hairband Stand, and is already planning to make two more to display all of her daughte'rs hairbands! I love the fun colors she chose, and can't wait to see more stands made in other colors! I also recently received an interesting suggestion on Ravelry, that the stand would be even more useful if one of the ends could open up to hold hair clips. That would really maximize the storage capacity! I love the idea! The internet never ceases to amaze me and the connections between crocheters that can be made are invaluable. It is so great to have the exchange of ideas! Painting Crochet on I love Yarn Day 2015!